Transfagarasan is a mega-road, built by communists who feared the invasion of other Communists. Simple, short and superficial. But after the regime change in late 1989, the Romanians managed to see its true value. The Russians have not come to plunder after all, the strategic importance of the road has been lost, but the passage of time has transformed it into a fast river of asphalt that runs through the mountains . Both the driver and the rider added it to their bucket list for a ride along with their favorite motor toy. 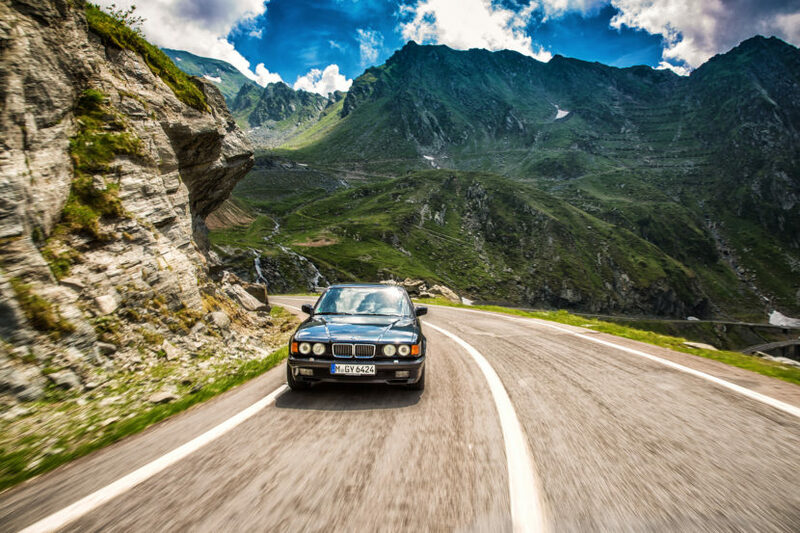 Two boys from BMW Romania have begun to dream of an event that unites the pleasure of driving with the pleasure of stareing at mountains, and that dream has given rise to a titanic job on their part to host a tour with some BMWs from the BMW Classic garage through Romania. This itinerary, which probably began with a corporate presentation in Powerpoint, would take about five days to end, almost defiantly with an event in total antithesis with the communist ideals – a competition of boyar-style elegance in a royal atmosphere of constitutional monarchy. At a time when the trips for test drives outside the country are from one day to the next, it seemed like an excess of Communist zeal. 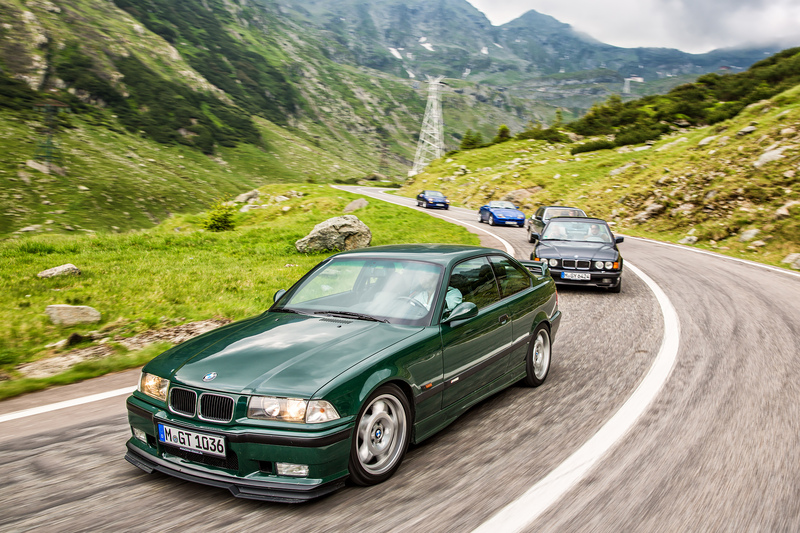 Then I saw the cars I was going to drive and joined the party without any further objections – BMW 745i E23, BMW 750Li E32, BMW 850CSi, BMW Z1 and BMW M3 GT E46. 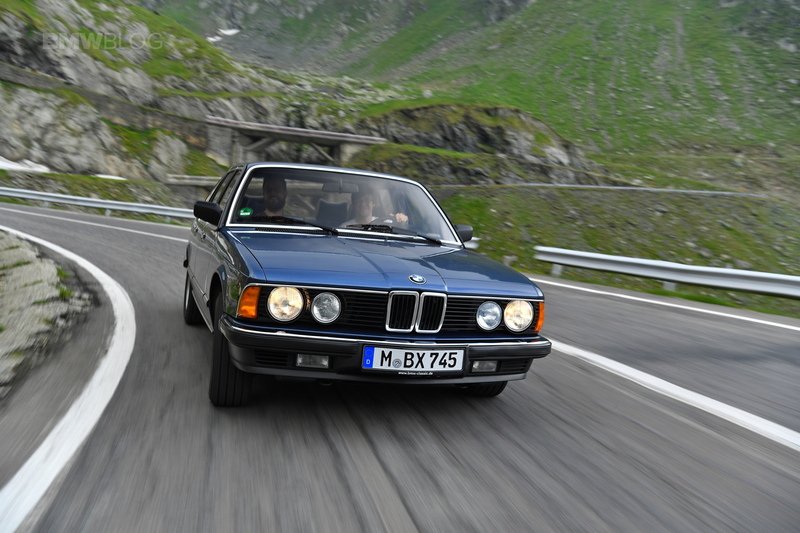 The first car we got to drive was the first BMW 7 Series, but not just any 7 Series, it was a 745i from 1983. It looked like an E24 with four doors, in short, but this comparison has to stop. A lot of chrome, small wheels, very tall tires. Inside there was a smell of hot plastic, vinyl discs, pipe tobacco and aged wood. Had no leather interior, but the blue cloth in combination with the open-pored wood inserts made up an interior of a rare boldness. It is a clear confusion inside the first 7 Series, as if it wanted to evolve and still be anchored in the past at the same time. This car has more buttons than a dictator’s desk and the long German words on each of them did not help much either. The body is simple and elegant, but the dashboard is so complicated and confusing. 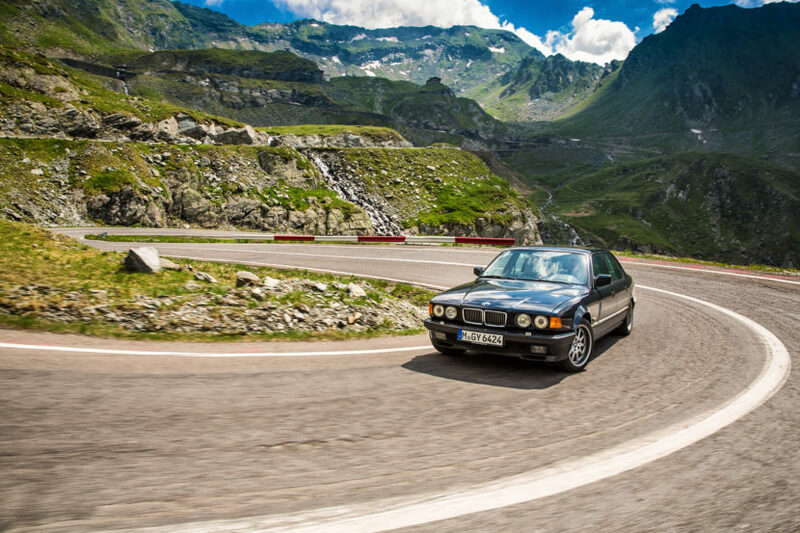 As we approached the Transfagarasan, the road was becoming more and more twisty, and the thought of visiting the M3 GT was very persistent. After the civilized waltz in the 745i, the pogo from the rock concert was about to start. At first glance, the M3 GT is an ordinary E36 Coupe, only the special-size wheels, the front lip and the large-size spoiler make it a little bit noticeable. It looks more like an E36 slightly modified by some boys in the back of their yard , but at a closer look comes the side logos telling you that this is not an ordinary cat that sits all day at the mouth of the stove. In fact, this is a car that was built to homologate a racing variant for the FIA ​​GT and IMSA and was the rarest car here, being produced in just 356 units, all in this British green. It’s about 30 kilograms lighter than a normal M3, it has an oil pump with motorsport pedigree, stronger suspensions and some ECU remapping that brought him about 7 extra horsepower. The 296 PS does not sound a lot, and on today’s standards the M3 GT cannot be considered a very fast car. But who says you must necessarily have all the horsepower in the world to feel especially at the wheel of a car? The M3 GT brings out strange sounds that come from everywhere and corner you in those sport seats with green leather in the middle and gray alcantara on the edges. In front of you there’s a steering wheel that looks too big and too thin for a BMW; down to the right you have a five-speed manual enclosed by some carbon fiber inserts and in the rearview mirror you see a mountain road that winds very fast. I did not lower the revs below 6,000 rpm, kept most in second and third, and I think the M3 GT liked it too. The 296 hp begin acting like a chorus at 7,000 rpm, when the car begins to transmit vibrations through all the joints. The aluminum doors rattle when you approach the red line, the steering wheel and the gearshift feel like they’ve been covered with hundreds of humming bees, and the M3 GT turns into a huge vibrating tool. 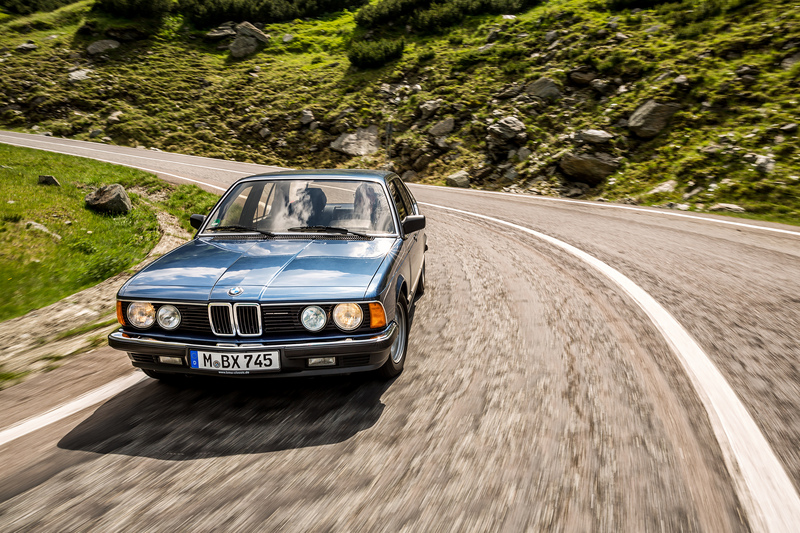 After a hot ride, it was time for a cool one – the 1993 BMW 750Li E32 . This car had the most kilometers on board (if 29,000 seem to be many), but was in mint condition. 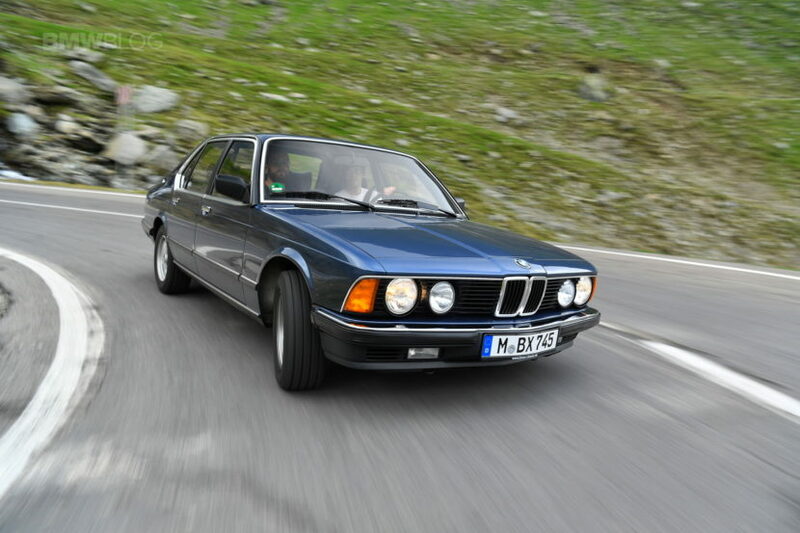 The second generation of the BMW 7 Series also received the first V12 engine to be installed in a german car after the war and this one had a V12. At the time of launch, the BMW E32 could be equipped with telephone, fax, a mini cellar for your wine collection, stability control, but also needed a second battery located in the trunk and another alternator to handle all the electronics. It is the model that stretched the red carpet to the modern, luxurious, super-luxury BMW. The V12 version has a longer wheelbase of about 12 cm, and there is room in the back for two mafia bosses, plus their accountant. It was the BMW that I wanted to spend the most time in on straight roads. The 300 PS are delivering calmly, gradually, like a death sentence by lethal injection. You’ll say it’s a slow car, but its reserves are more hidden and only come out when the police start their sirens. Otherwise, it’s comfortable, spacious, solid and damn beautiful. The generous size wheels for the 90s looked good, but they steal little of the comfort on the Romanian roads. 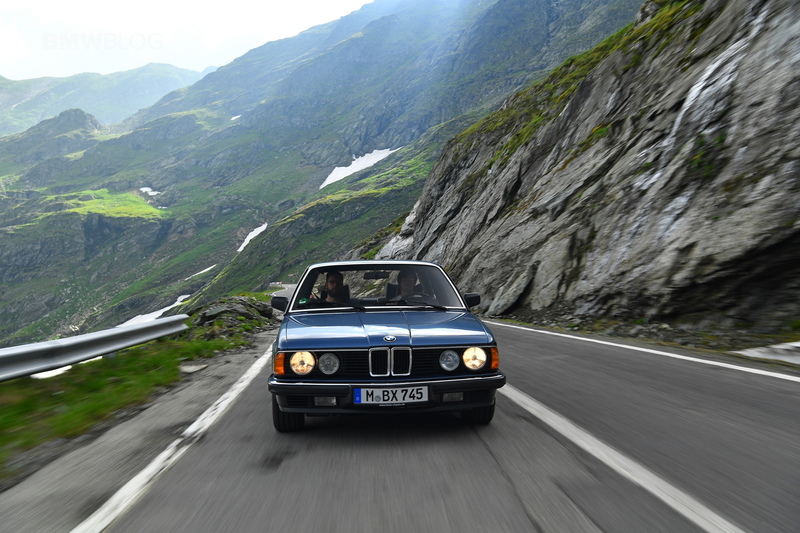 Five feet long and weighing nearly two tons, the BMW 750Li on Transfagarasan is like a shark among smaller fish who race against time up the mountain rivers to spawn, but believe me, it felt like an old school BMW. Last was the car that really made me nervous – the BMW 850CSi. It was blue, it had only 11,000 km and it looked like it was going to be released soon. 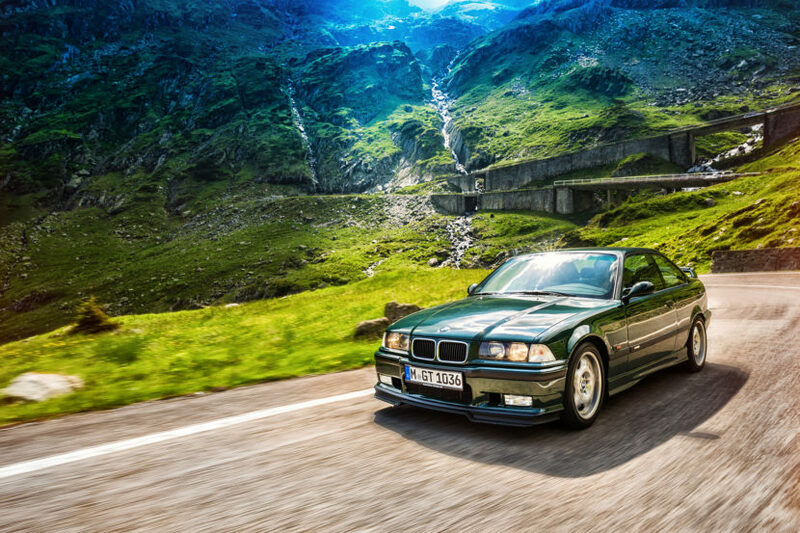 The car that nearly put BMW into a financial hole in the 90s, looked amazing on this road. The BMW 850CSi is intimidating, especially when you know that only 1,500 units have been made, especially when you know it is very wide and has over 1,800 kilos, and the roads were narrowing in some places over big cliffs. Inside, I almost wanted to look for the Start button, electronic handbrake and USB entry. The car looks modern even today and the blue and black interior was fabulous. It’s definitely a GT – you sit very low, the windscreen is huge, you have a lot of space in front and everything is arranged around you to encourage you to take a very long trip away from city roads. The BMW 850CSi was the car in which BMW wanted to perfect the art of design and display all of its accumulated knowledge, even at the risk of losing money – which happened. Its integral active steering for the rear wheels and electronic damping control, before they seemed like a modern witchcraft to us, started their heresies in the 8 Series. 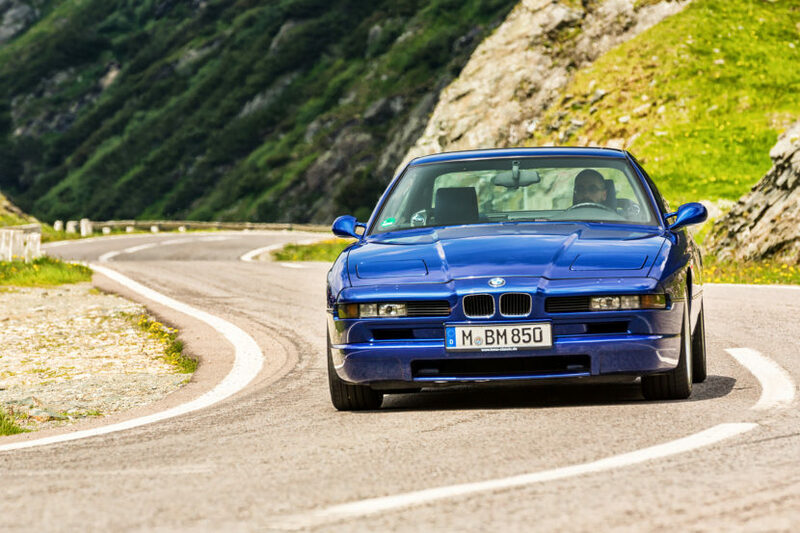 Undoubtedly, the BMW 8 Series has been a very advanced car for its time, maybe too advanced. That’s why BMW is more meaningful nowadays, being a car that, although it’s old, is rather new. You can feel how tough and heavy the car is when you open the door, because it’s like trying to open a door of a car that sits on the bottom of a pool. The doors are heavy, very heavy. However, once you get used to the six-speed manual, the weird clutch and the inertia of a 1,860-kilogram machine, the BMW 850CSi turns into an oversized coupe able to tolerate everything you throw at it – deep holes, wavy asphalt, tight turns with boulders in the middle. It’s amazing how BMW has managed to build in the 90s a machine that can stand on shoulder to shoulder with modern generation cars in terms of comfort and ride. The rear wheel steering intervenes to counteract the heavy-duty engine on the front axle, and if you do not have the desire to hit high-speed hairpins and you are happy with keeping a decent rhythm, then you can call it a sports car. After all, it is a 381 CP and 550 Nm BMW Coupe. We ended our day on Transfăgărăşan with a mountain-top picnic, where we served some foreign journalists with pig skin (traditional Christmas treat). Some adventured into this culinary experience, others took a pass. Then we went, of course, to visit Bran Castle, or Dracula’s Castle, where we met the best tour guide in Romania, a lady who mixed history with stand up better than George Carlin. Even if you are Romanian and you have visited Bran before, for this lady’s sake, you should do it one more time. We ended the day with a respite at Cantacuzino Castle in Busteni, and that night we shared impression about our favorite cars and women wearing mustaches. 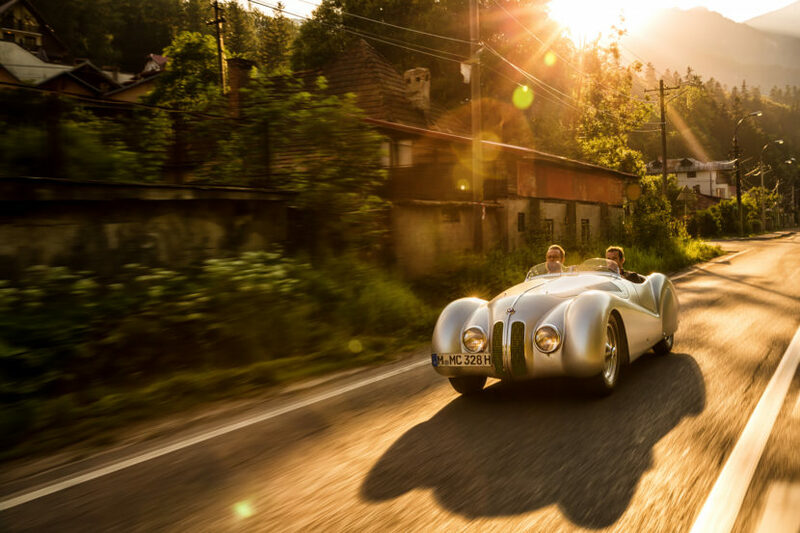 The next day, the final one, we went to the Sinaia Concourse d’Elegance, where we were about to meet a rare twenty-million-dollar old lady, one of just three in the world – the BMW 328 Mille Miglia Roadster. At Peles Castle, the weather was gorgeous, people were elegant and cheerful, and a smell of petrol mixed with the smell of coffee and pine trees floated in the air. Sticks, hats, umbrellas, handkerchiefs, cigars, sunglasses and interwar shapes were everywhere. Interwar buildings, interwar cars, interwar people. Some of them were simply flattering virtuosos, but most of them were connoisseurs. 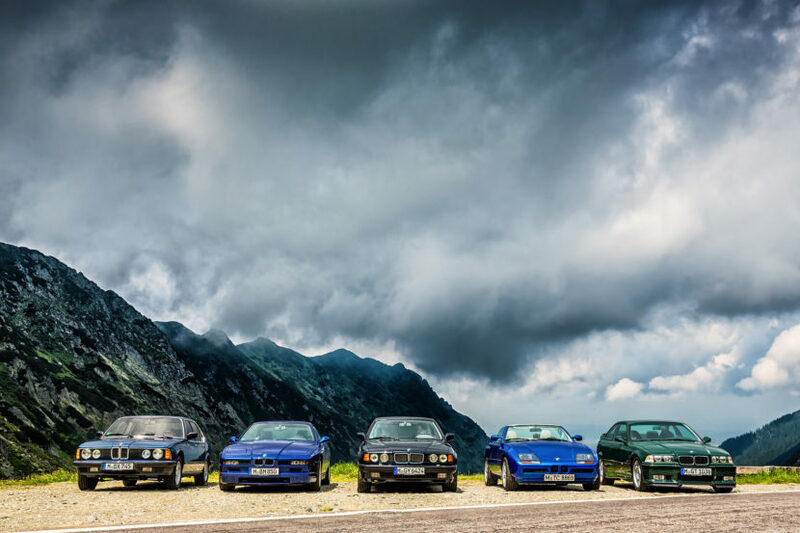 I do not know if you realize what this meant for us, those who took part in the BMW Classic Tour, and those who came as simple spectators, but as an organizer, to bring this car to Romania, it was a dream come true. Especially after Marin Dumitrescu, now 96, the Romanian pilot who won the Grand Prix in Sinaia in the 50s with a BMW 328 tuned by him in his garage, beating the BMW factory teams who also drove the 328 and other big name racing drivers from the 50s, took a ride in it. The chances for the two of them to meet again in this life were very small, but sometimes chance is nothing more than what you get after working very hard, after you suffered and after you dared to hope until the last minute.